The attack landscape is volatile – in Q1 the ThreatScore for the largest retail banks jumped 500%. This volatility demonstrates that even companies who are implementing security best practices can never let their guard down. While Q1’s spike is primarily the result of two months of heavy spamming connected with two banks, this shows that criminals are constantly shifting their targets, and that any notion that a company or sector is permanently “safe” is entirely false. We have just released our Q1 TrustIndex, which covers the period from January through March 2014 and identifies the sectors and companies that have the highest and lowest risk for dangerous emails – with a focus on the beleaguered financial industry. You can download the complete Q1 TrustIndex for free here and see how your industry stacks up. 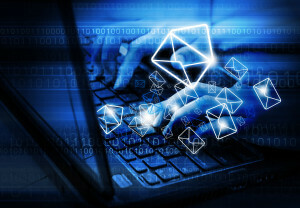 Retailers are still one of the main targets of email attacks, yet the sector’s ThreatScore decreased by nearly 53% from Q4 to Q1, indicating that fraudsters are aiming for higher profile attacks. Etailers remain leaders in email security, with companies such as Netflix, Amazon and Groupon maintaining perfect, or near-perfect, TrustScores. Retailers have a long way to go to catch up to the security practices of Etailers. Agari Proud to Join FS-ISAC Again This Year!